Dresden Magazine: The diversity of Dresden. Saxon is not a corrupt form of High German but rather the reverse. Peter Ufer, Dresden-based writer and author of "The New Gogelmosch: the Exclusive Dictionary of the Saxon Language"
Five researchers, five disciplines, five passions – Dresden provides the inspiration. Rolf Heinemann took a former GDR state-run enterprise and gave it a new lease of life. 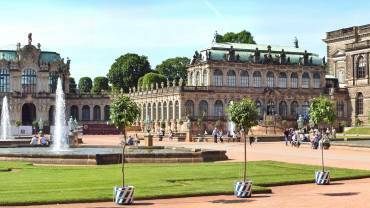 See Dresden as a series of 360-degree panoramas. The view from thirteen locations was captured by drones and from high tripods. It allows you to stand at the top of the Frauenkirche, fly over the Blue Wonder Bridge or hover above the Zwinger – all from the comfort of your home computer. And for smartphones, there is a virtual reality feature!